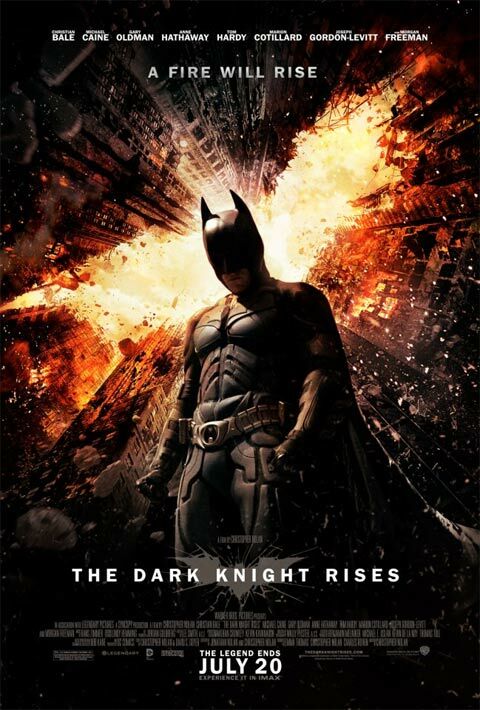 Opening 8 years after the events of The Dark Knight, The Dark Knight Rises opens with an optimistic Gotham city enacting the Harvey Dent act that has made the city more secure. Bruce Wayne (Christian Bale) and Batman haven’t been seen in those 8 years. There was no need for them. It is then that a masked man named Bane (Tom Hardy) kidnaps a Russian scientist from a CIA extraction operation and kills everyone on board of the plane so the wheels of his plans start spinning. Bane wants to bring Gotham its reckoning. He wants to break the city that has sunk so low in decadence. In the meantime, Wayne enterprises is no longer making profit because of a very ambitious and expensive environmental-friendly project. There’s also a new player in town: Selina Kyle (Ann Hathaway), a very cunning jewel thief, who’s seeking a way to absolve her past. And as events progress, Gotham and its people sink into despair as a false sense of justice is set in. And as Bane rises, the necessity for the Batman rises as well. But will he be able to match Bane? Or will the Bat break, taking with him any hope Gotham city might have? Simply put, The Dark Knight Rises is a very slow movie to start. And at an almost three hours running time, that’s a lot of time for it to get going. The sad part is when it gets going, it doesn’t capture the epic feel of its predecessor. It doesn’t come close to the sense of urgency that The Dark Knight entailed. It doesn’t come close to the sense of dread, fear and danger that the Joker was able to put in us – even though Bane’s plan was more dangerous. Tom Hardy does a good job at portraying the masked villain. He is ruthless, powerful, dominating and frightening. Christian Bale as Bruce Wayne and the Batman does his best portrayal of the character in all three movies of the trilogy. His characters are weakened, losing hope, wanting to feel strong again and wanting to save the city they love. He manages to convey all those opposing emotions very well. 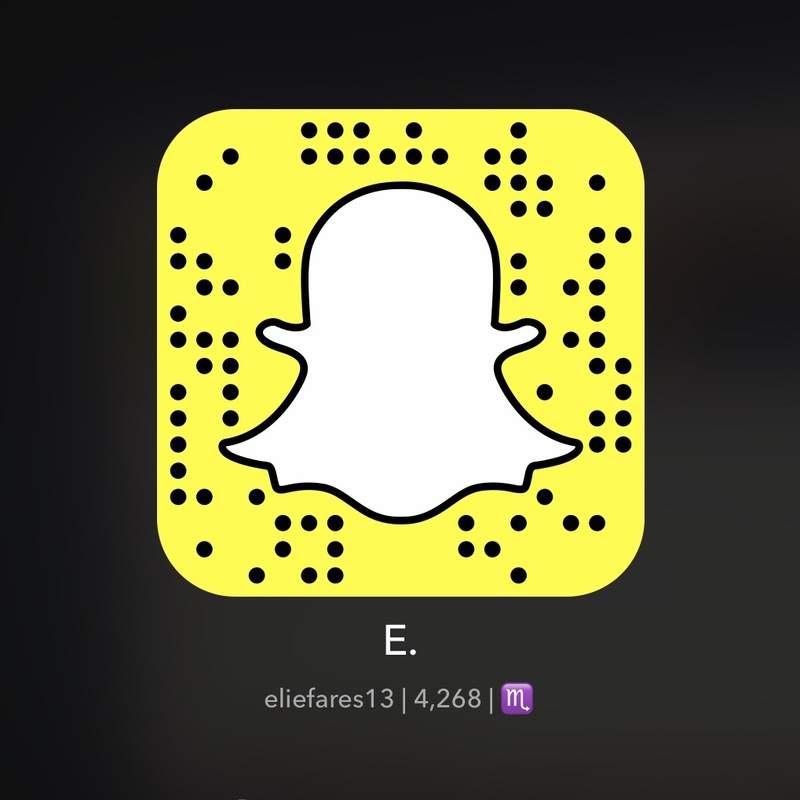 Marion Cotillard, as Melinda Tate, a board member of Wayne Enterprise, manages to hold her own but her character is so underdeveloped that her entire presence feels underwhelming. She doesn’t manage to do what she does best and that is steal the show whenever she’s on screen. On the other hand, Michael Cain as Alfred, Bruce Wayne’s butler, and despite the little screen time that he gets is great as the man who wants to keep the boy he raised safe, out of harm’s way, and most importantly alive. However, the most interesting cast choice was actually Ann Hathaway. She was absolutely brilliant as Selina Kyle and was probably the most fun to watch. She is terrifying, fun, quirky, powerful, afraid, vulnerable, strong…. And she manages to bring forth empathy in the viewer despite her many flaws. She’s fits into the tone Nolan set for the movie perfectly and betters it. Gary Oldman returns as commissioner Gordon. Joseph Gordon-Levitt stars as John Blake, with an interesting middle name, a new addition to the police squad and a firm believer in the Batman. Morgan Freeman returns as Fox, the genius behind all the Bat techs. There are also many other characters from the previous Batman movies that will make an appearance as well. The purpose of The Dark Knight Rises is to bring things full circle. However, instead of bringing things to a closure with a bang, The Dark Knight Rises fizzles away and ends the epic trilogy with a thud. Perhaps I expected more from the movie. Perhaps its only purpose was to bring the Bruce Wayne story arc to its emotional end. But with the long running time and the employment of so many different story lines that don’t go at odds with each other, the stage was set for The Dark Knight Rises to be much more. The movie boasts brilliant special effects to the backdrop of a masterful score by Hans Zimmer, the best of which is Rise which plays at the movie’s last scene. But even with all of those epic components, The Dark Knight Rises falls short. It is definitely a good movie by all measures – perhaps even better than good. But the standards set forth by both of its predecessors and by Nolan’s previous works as well set the bar way too high and it seems Nolan has faltered and fallen short. 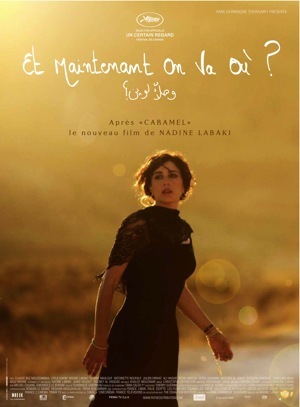 Should you watch it? Definitely. You will more than enjoy it. You will get goosebumps and you will get emotional. But you won’t go out of the movie theatre shocked like you were with The Dark Knight and you won’t go out of the theatre raving about the brilliant movie you just watched. One thing to be grateful for, however, is Nolan breaking the boundaries of comic book-based movies and delivering an Oscar-worthy trilogy that will never see any golden statuettes. 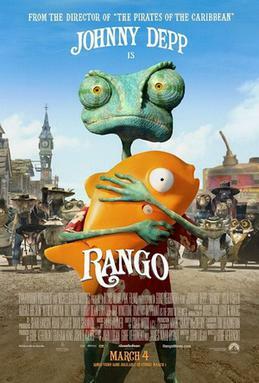 Rango starts when a pet chameleon (Johnny Depp), after trying to orchestrate a very fancy looking play with a plastic fish and beheaded doll, gets stranded in the Mojave desert after he falls from his owner’s car. There, the chameleon (who is still nameless at this point), dazed and confused narrowly avoids getting killed by a hawk. Then, the chameleon meets an iguana named Beans (Isla Fisher) who takes him to the desert town: Dirt. In Dirt, the chameleon finds the opportunity to be whatever he wants. He chooses to be Rango, a westerner marksman, and moments later, when the hawk comes back to terrorize the town, Rango kills him by firing a lucky shot that gets an empty water tower to squash the hawk. However, soon after their arrival to Dirt, Beans discovers that the water reserves are dangerously low, which prompts her to ask Rango, who gets appointed sheriff, to investigate the matter. Rango undertakes her request and as the movie progresses, you find out the water issue is more complex and twisted than any of them first imagined: control the water and you control everything. Rango is not your typical animated movie. It is definitely not something for the kids. After all, how many times do you hear the words “prostate exam”, “I’m ready to mate” and so on in a cartoon? The movie is a celebration of everything that is Western. There’s even a Clint Eastwood sort of appearance, just to top it all. Johnny Depp is brilliant as the voice of Rango. The chameleon who embodies many personalities, depending on how he sees fit, needed an actor as versatile to give him life. And Johnny Depp does not fail at this. He plays well on screen with Isla Fisher, who has come a long way from being a shopaholic, with her impeccable western accent. Director Gore Verbinski, known mostly for the Pirates of the Caribbean movies, strings this movie together as an overall tribute to the western genre. There are hints from many famous western movies in Rango that anyone who’s a fan of the genre would pick up. Add to that the brilliant work of Hans Zimmer on the score, as well as screenwriter John Logan, and the movie becomes a very strong movie overall. Rango is not a very pretty movie in the sense that animated movies are almost always aimed at providing audiences with a cute looking hero/heroin before anything else. Here, even the good people are cringe-worthy when it comes to the cuteness element, which goes to show how much the creators of Rango did not waver in them wanting to make an animated movie that’s not addressed to a particular audience, but one that fit their vision. Rango is a movie with many firsts. This the animators’ first animated movie and the director’s first animated movie as well. But you don’t feel that it’s a movie of firsts when you watch it because everyone involved gives it their all to make it as good as it could be. And yes, it is good. The first Pirates Of The Caribbean movie, The Curse of the Black Pearl, was a strong opener for the franchise, which reached its peak with its second installment: Dead Man’s Chest, a movie that was awesome all around: great acting, great storyline and an awesome cliffhanger, the likes of which you only see in certain TV shows where the wait is simply a few months. So the expectations for the third installement, At World’s End, were very high. But the sophomore slump expected for Dead Man’s Chest apparently skipped a generation and landed on At World’s End, making the movie a total disappointement. So it’s safe to say that I wasn’t too excited about the Pirates of the Caribbean franchise reboot, with their fourth installment: On Stranger Tides. With most of the cast returning (the only people missing are Keira Knightley and Orlando Bloom, not that I care that much) and adding new faces in the form of Penelope Cruz and Ian McShane, the franchise was set to restart anew. And restart it does. Not only is the movie an immense enjoyment, it is also engaging and visually stunning. 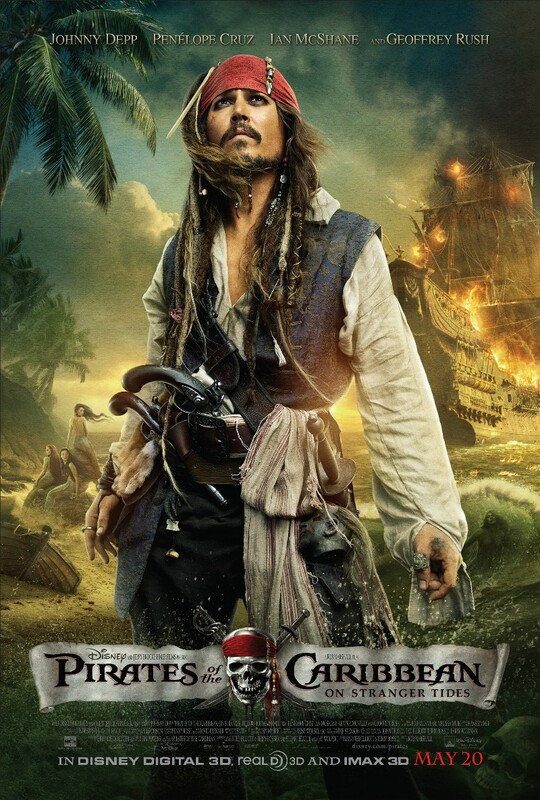 Starring Johnny Depp as Captain Jack Sparrow, On Stranger Tides is the three-way race to the Fountain of Youth between the English, led by ex-pirate Barbossa, the Spaniards and the ship Queen Anne’s Revenge, which is Blackbeard’s (a rival captain portrayed by Ian McShane) ship. Each one of those three has their separate knowledge of the path to the Fountain of Youth and their own agenda for going there. But the path to the fountain is filled with dangers and in order to harness the fountain’s powers, one needs to collect a mermaid’s tear, two chalices of the ancient ship Ponce de Leon’s wreck, both of which are not as easy to get as it seems. Penelope Cruz portrays Angelica, one of Jack’s old flames and Blackbeard’s daughter. I thought she was an interesting addition to the franchise, becoming, yet again, the only woman on a crew of pirates. She’s quite safe in her role, not presenting anything groundbreaking on screen, but it works in the space she’s allowed to have in the movie. On Stranger Tides also welcomes newcomer Sam Claflin, a Christian missionary, whose role as Philip in the movie is essential on two accounts: crucial advancement of the plot and some comic relief at particular tense moments. On Stranger Tides begins with a set of duels and escape attempts. It isn’t until after the first thirty minutes that the movie starts to bite into its plot, with the characters well off at sea. It is then that you are presented with a truly magnificient scene involving mermaids and the movie starts running full throttle till the end. Johnny Depp, whom I believe did the last Pirate movie of obligation more so than passion, is back in force for this installment. It’s refreshing to see Jack Sparrow be his regular self again: playful, never serious and uncannily witty. The special effects in On Stranger Tides are brilliantly executed as well. If the overall acting ensemble didn’t engage you in the movie, the whole effect of this “other world” will do the job. There isn’t any part that looks unrealistic and everything is executed with the utmost care for details. Moreover, Hans Zimmer is, yet again, a genius at what he does. The score of On Stranger Tides is chills-inducing, especially when the Pirates of the Caribbean theme gets played inside the cinema and you get that warm feeling of epicness inside you. Overall, On Stranger Tides is a breath of fresh air in a franchise I thought had lost its way. It’s an enjoyable movie that, despite its many flaws, manages to entertain you and, at least for two hours, make you forget about the things you left at the theater’s door. It immerses you and you can’t help but be thoroughly enjoyed by whatever’s taking place on screen. You don’t need to have watched the previous installments to understand what goes on in this one, just go as you are and watch! The time of the year is here and in preparation for the big event tomorrow, I have decided to post my Oscar predictions. – Who should win: Inception. If you had asked me a month ago what movie was the clear favorite for best picture, I would have easily answered “The Social Network” but having not lost a single guild award it was nominated for and with it building momentum by the minute, it’s hard to see how the movie that is nominated for 12 Academy Awards will lose. However, regardless of the exquisite movie that is The King’s Speech, no other movie apart from Inception deserves this. Out of all the nominated movies, it’s the one that was the most ground-breaking this year and while many believe ground-breaking is not a criteria to warrant a best picture win (I still think Avatar was snubbed last year), in this case it does because Inception is a masterpiece. Read up on my reviews of Inception and The King’s Speech. This category has 5 nominees. One of them has a 99% chance of winning, James Franco has a little less than 1% and the rest is divided among the other 3. Colin Firth has led a remarkable campaign and if he doesn’t win this tomorrow, it will be the biggest upset of the evening. While brilliant in his portrayal of the stuttering king, I believe James Franco had one of the best acting performances of the year. The whole movie he’s nominated for is built upon his performance, so much in fact that removing his performance out of the equation would render his movie bland. Colin Firth’s performance, while still remarkable, relied heavily on his interaction with Geoffrey Rush and Helena Bonham Carter, which makes Franco’s solo act the more fascinating. Read up on my review of 127 Hours. With acting, it’s ultimately a matter of taste. I believe all of the nominated actresses are deserving of a win and it ultimately comes down to the role you preferred and out of the nominated five actresses, the one that struck a cord with me was Jennifer Lawrence in her portrayal of the struggling teenager in the dark Winter’s Bone. Natalie Portman is winning this, the only dark horse being Annette Bening for The Kids Are Alright. Read up on my review of Winter’s Bone. To think this is the same man who played Batman in Nolan’s reboot of the franchise is daunting. He portrays his pale, drug-addict character brilliantly. He has already grabbed most of the awards related to this category and he’s the obvious frontrunner. Read up on my review of The Fighter. Out of all the acting categories, this looks like it’ll be the closest one. Up until very recently, Melissa Leo was viewed as the obvious frontrunner in this but leading an Oscar campaign, where she printed out posters calling Academy members to vote for her, has left some people turned off. Add to that an exponentially increasing momentum for The King’s Speech coupled with a BAFTA win for Helena Bonham Carter followed by a brilliant speech and you might have a recipe for an upset. Regardless of that, my favorite out of the bunch remains Amy Adams for her role as the girlfriend trying to guide her significant other to find himself. A very plausible dark horse in this race is the young Hailee Steinfeld who, in my opinion, should have been nominated in the best actress category for her role in True Grit. The person who should win this isn’t even nominated. Yes, I’m glaring at the non-existent Academy member that might end up reading this. And for that, this category is almost a lock now for The Social Network’s director even though it looks like Tom Hooper, director of The King’s Speech, is giving him a run for his money. Read up on my review of The Social Network. I’ve honestly enjoyed both movies and Toy Story 3, being nominated for best picture as well, is winning this. But my heart goes to How To Train Your Dragon, an animated movie inviting everyone to break away from stereotypes and closed bubble that society enforces upon us. No other movie deserves these technical awards because, simply, Inception was groundbreaking. Inception, again, isn’t even nominated here. But can you imagine watching that movie if the editing hadn’t been as top-notch as it was? It would make the near-incomprehensible movie basically “Einsteinian”. 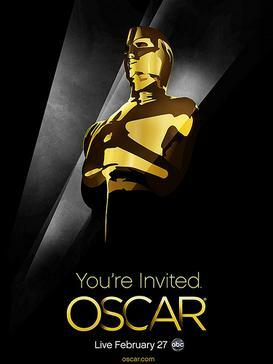 Out of the nominated movies, two come to mind with strong editing and those are: The Social Network and 127 Hours. In the latter, strong editing serves as a way to take the character away from the two rocks between which he’s stuck, allowing for some really good double-camera work and allowing the viewer to further immerse himself in this story to which he already knows the ending, making it even more fascinating to watch. The Social Network has some really great editing as well as it tells three different stories going on at different times and manages to merge them together in a very coherent way. I believe, because of buzz, The Social Network has the edge. Even though Harry Potter is nominated for this and my heart wants it to win, the clear frontrunner here is Inception. And it’s not my bias speaking: an upside-down city, dream within a dream within a dream within a dream construct, a whole glacier-like city in limbo… no other movie deserves this as much as Inception and it will win it. The Social Network’s strength is its screenplay. It’s witty, fast and engaging. Aaron Sorkin deserves this. I think this could go either way between both names. Inception won at the Writer’s Guild Awards but The King’s Speech was not eligible for a nomination. I want to see Christopher Nolan win this but I have a feeling it will be another casualty of a King’s Speech sweep. After winning the Golden Globe, I believe The Social Network’s score has the momentum to take this. But I still stand by the brilliance of Inception’s score. Hans Zimmer has come up with a masterpiece that isn’t being recognized enough. There are many more categories, of course, but I believe these are the ones most people care about. You’re waiting for a movie, a movie that will take you where no other movie has taken you before… Inception is that movie. To say this is a brilliant movie would be a gross understatement. Rising to the status of a cult-hit in mere months, this is beyond a doubt the movie of the year. Regardless of whether the later hype of other movies didn’t help its award chances, this is the movie that will forever remain in the minds of audiences. Sort of like last year’s Avatar. This is the movie highlight of 2010. Written and directed by the amazing Christopher Nolan (and I mean, is there a Christopher Nolan movie that you have not really liked or come to appreciate? ), Inception tells the story of a time when accessing people’s dreams to obtain information is a possibility. Cob, portrayed by the brilliant and under appreciated Leo DiCaprio, is a dream architect who is haunted by his own subconscious represented by his deceased wife, Mal (think French with the name), portrayed by the breathtaking Marion Cotillard. Accused of killing his wife, Cob is offered the chance to go back home to his children on the condition that he pulls something that was never done before – plant an idea inside the head of a business giant’s son to break down his father’s empire; hence, the title: Inception. To do this, he must get together a team that will help him pull off this multi-layered dream construct. The movie might be about dreaming but you need to be fully awake to comprehend what’s going on. I believe the reason Inception is not getting adorned with the awards it deserves is basically because the award personnel did not understand it or found it too complicated. However, a movie of this magnitude deserves much more than the technical awards it’s scarcely receiving. Not to give Christopher Nolan a nomination for his direction is an abomination and he doesn’t look like a favorite for the original screenplay he wrote as well. Regarding the acting, Inception’s strength is in the collective work of its whole acting body. All of the actors and actresses in this movie are helping the main character, Cob, to find salvation through this dream into the subconscious. The interactions between the characters themselves and between them and their surroundings are truly marvelous, a simple manifestation of the brilliance of the screenplay and director moving them. The special effects in the movie are top-notch and some parts are reminiscent of The Matrix. The movie bends around the laws of physics like child’s play and somehow manages to convince you that all of this makes sense. The soundtrack, composed by Hans Zimmer, is also my favorite out of all the movie soundtracks released this year. My favorite track on it “Time,” a musical composition that I believe is absolutely stunning. Another notable track is “Dream Is Collapsing.” Listening to the soundtrack, it flows very smoothly and feels like it’s one part it’s separated into tracks. The inspiration for it was “Non, Je Ne Regrette Rien” by the great Edith Piaf. Overall, if you haven’t watched this then what are you still doing reading this?